Bundts (or, at least, the confections that inspired them) may be generations-old Eastern European cakes, but the signature aluminum pan they’re baked in is a modern innovation. Bundts (or, at least, the confections that inspired them) may be generations-old Eastern European cakes, but the signature aluminum pan they’re baked in is a modern innovation. Bundt pans were invented by H. David Dalquist in 1950, and today we use them to make those classic cakes and also to roast up extra-crispy-skinned chicken. Dalquist was the owner of Minnesota's Nordic Ware company, and he cast the pan for the Minneapolis-based Hadassah Society (a group for Jewish women), which wanted to recreate traditional kugelhopf—a dense, ring-shaped cake. Originally, he called his invention a bund pan, for the German word that translates to "bond" or "alliance." Why did he add the T? No one knows, though some speculate that Dalquist wanted to put some space between the name of his product and the German-American Bund, a pro-Nazi group. Others guess it was was for trademarking purposes. 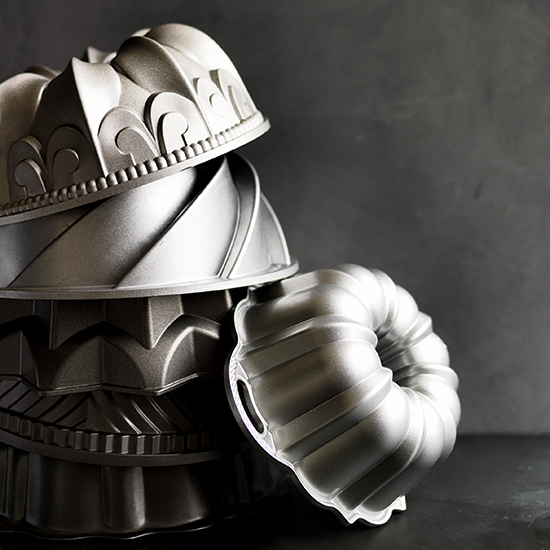 Demand for the distinctly shaped aluminum cakes grew slowly after that initial order, but it wasn’t until 1966 when production really blew up—thanks to a Bundt cake placing second in the 17th annual Pillsbury Bake-Off. The gooey, chocolaty cake (called the Tunnel of Fudge Cake) inspired women around the country to try making their own Bundt cakes. Dalquist was inundated with orders and started making 30,000 Bundt pans a day. Today, more than 70 million households have a Bundt pan. Dalquist died in 2005 at the age of 86, still overseeing the production of his hit pan. Experience an elevated take on the cake that made the Bundt pan famous with expert baker Matt Lewis’s Tunnel of Fudge Cake with Hazelnuts.